Actually, it all came together rather quickly. Some friends of mine saw an article in the travel section of the local paper describing this repositioning cruise for Holland America‘s Volendam. 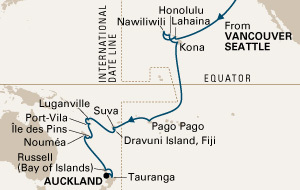 I looked at the itinerary, and liked all the ports of call in the South Pacific. I realized that if I wanted a choice of staterooms, I had to decide quickly about this trip, since it was almost sold out. I ended up booking a mere four hours after hearing about the cruise! A few days after booking the cruise, I booked my return flight home on Qantas from Auckland to Victoria. I very much liked flying with Qantas last time I was returning from New Zealand in 2004. I took note that they offered a considerable improvement in in-flight service as compared with their competitors. My friends who alerted me to this cruise deal booked adjacent cabins on the same cruise a few days later. We made plans to tour New Zealand in a shared rental car, and agreed to confine ourselves to the North Island, so as to not run ourselves ragged. I wanted to visit with my cousin and a friend while on the North Island, so that added some purpose to the trip. My last trip to New Zealand in 2004 was too short, so having two weeks would allow me to see the major sights on the North Island. I priced out the cruise, and factored in the single supplement; estimated the additional costs (on-board expenses, land expenses in New Zealand, and airfare home); and still found the trip was an incredible bargain costing only about half the normal per day costs for a cruise! I booked through the travelocity.ca online travel service, since I received Holland America’s Flash Rate. This reduced the fare even further by several hundred dollars. It was a fabulous trip. 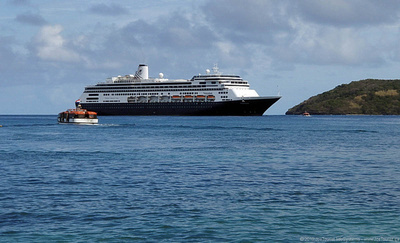 Holland America is a cruise line which continues to provide the personal touches for its passengers, despite the major cutbacks in service being implemented across the cruise ship industry. My friends and I feel we were spoiled while aboard the Volendam, and would be happy to book another cruise on a Holland America ship given our positive experiences on this ship. The highlights of the trip for me have to be Fiji (both the police band in Suva and the snorkelling and beach on Dravuni Island), wonderful snorkelling near Port Vila in Vanuatu, and seeing the beautiful Ile des Pins in New Caledonia. It was also a real treat to be able to see New Zealand`s North Island at a slow enough pace to enjoy both the scenery and the friendly people. This trip to New Zealand in 2010 lasted a total of 46 days – my longest time traveling. My full itinerary is listed above in sections – feel free to click on what interests you, however if you click on the top-most item, there are links on each page to take you to the next destination – from beginning to end. This is the best way to explore the whole trip.